The Staggies striker is well aware victory would send his team a massive 14 points clear at the Championship summit with only eight matches remaining. The Dingwall outfit lost 1-0 at home to United back in mid-November but were 5-1 winners in their last away trip to face the Tangerines. Much has changed since, though, with United a team transformed on the back of 11 January signings. For Graham, who has scored nine goals from 12 starts this season, tonight’s match is simply a huge opportunity for County. The 31-year-old said: “We’re looking forward to it. We’ve opened up a good gap at the top and Dundee United will probably see this as a must-win game. While County had to bring in several injury reinforcements in January, United manager Robbie Neilson made mass changes from predecessor Csaba Laszlo’s squad, bringing quality in the shape of Sean Butcher, Peter Pawlett, Morgaro Gomis and Osman Sow. 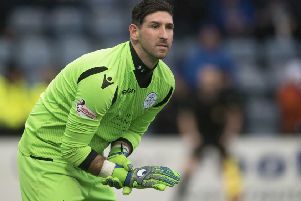 The expenditure initially brought a spate of victories but, more recently, a draw against Falkirk and defeats by Inverness and Partick Thistle have stunted progress. Graham insists County are ready for a very different United side. He stressed: “I think they’ve brought a full new team in January, so obviously Robbie Neilson wasn’t happy – and he’s changed it. “But we can’t really focus too much on them. We have to keep the togetherness here and keep working away to get results. “We’ve done our homework and we know what’s expected of us, what we’re up against. “We didn’t really expect to create the kind of gap we now have but, with the run we’re on we’ve been picking up results even when sometimes not playing particularly well. County co-manager Stuart Kettlewell believes County have reaped the rewards of a squad evolution, in contrast to Neilson’s revolution. Taking nothing for granted ahead of a huge night at Tannadice, Kettlewell expressed satisfaction at the way his squad were dealing with promotion pressures. He said: “Our focus from the start of the season was on continuity. We wanted to assemble a strong, spirited group of players that we believed in. “In the last few years at Ross County, we have seen a complete January overhaul of the squad. If you can get things right in the first place, then January is just about fine-tuning. “Thankfully, that is the position we found ourselves in. “We have had more injuries than anyone else so we had to bring in Andy Boyle, Lewis Spence and Kenny van der Weg who have all added something. “For us, it wasn’t a case of bringing in ten or 12 players but only getting something out of a few of them. We gained real value from the players we brought in. We have not had the ability to throw around ridiculous money. There has been big changes at United and quality of players they brought in is well-documented. “We never had those kind of resources after taking a huge budget cut from where it was in the Premiership. Kettlewell has Ross Draper, Sean Kelly and Ross Stewart all back in contention after recovery from injury. Iain Vigurs remains out. Nicky Clark has labelled tonight’s match as a “must-win” for Dundee United, but admitted: “We can’t though just go gung-ho and leave ourselves open at the back early on. We need to play the game properly and we know what we are good at and what our strengths are. United’s last home match ended in a bitterly disappointing Scottish Cup quarter-final exit at the hands of Inverness, and Clark admits they owe their suffering supporters big-time. He added: “The supporters deserve better than what we have shown in the last few weeks. “We had an unbelievable crowd in for the Inverness game and we let them down. The boys were all sick afterwards. It was a great chance for us in a quarter-final but we didn’t perform at all. “Again, away at Thistle last week was very disappointing for us. “So we have something to prove to the fans and we need to have a really good reaction. Neilson’s hopefuls had their league game with Dunfermline called off late on due to a waterlogged pitch at the weekend, but Clark reckons that could work in their favour going into the showdown with oss County. He said: “We were off the bus and into the dressing room before going out briefly to look at the pitch. It was then that they made the decision so, yes, it was a little bit frustrating, especially for our fans who would already have left to come down to support us. “When we saw the pitch we immediately thought there was no chance it would be on. “But if it had, it was a really heavy pitch and we would have had to work very hard for 90 minutes.